An Púca, A faerie Ghost. Well its finally that time of year, Oíche Shamhna Shona Daoibh. So today I will share with you the history of one of the most menacing or beneficial creatures to be found in Irish Mythology. The Pooka or in Gaelic An Púca translates to Spirit or Ghost. The Púca is also described a type of faerie that can appear in any form, but they are closer are considered to be closer to a Goblin than goblin than the typical winged-type fairy. Some say that they are the remnants of the Tuatha Dé Danann whom once inhabited the island before the arrival of Man. They are said to mainly roam rural communities and are known for their shape shifting abilities. Most commonly they would appear in the form of a black horse, a goat or a rabbit. 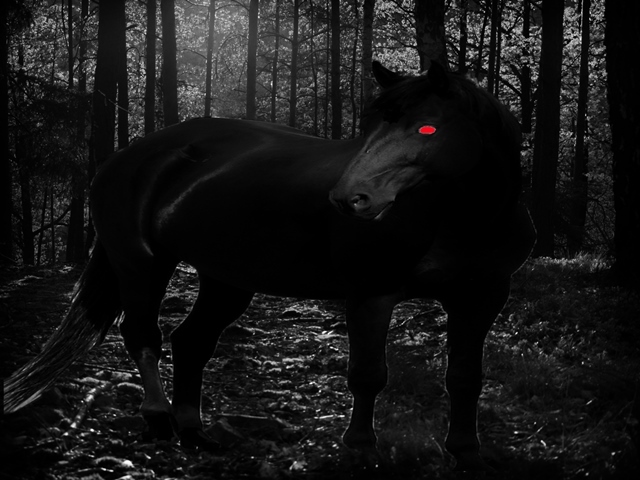 One common description tells of them appearing in the form of a wild black colt with heavy chains around their neck, they were said to do harm to unwary travellers. Another description shines a different light were they said to be helpful creatures to those whom did them a kindness. However this tends to be the exception to the rule as most known encounters with the Púca are unpleasant at best. This is not surprising as many tales of a nasty experience with the Púca come from Christian times when all respect for the old ways and nature have been lost. Whether the Púca be a spirit, ghost or some elemental nature spirit or a remnant of the Tuatha Dé Danann whom are also referred to as the Faerie Folk I don’t know. As of yet I have not encountered a Púca. No matter what shape the Púca takes, the one giveaway will be that its fur is almost always dark and it will have unusually otherworldly golden eyes. If a human is enticed onto a Púca’s back, it has been known to take them on a wild and scary ride. However, unlike a kelpie, which will take its rider and dive into the nearest stream or lake to drown and devour them, the Púca will do its rider no real harm. According to some legends the only man ever to successfully ride the Púca was Brian Boru, High King of Ireland. 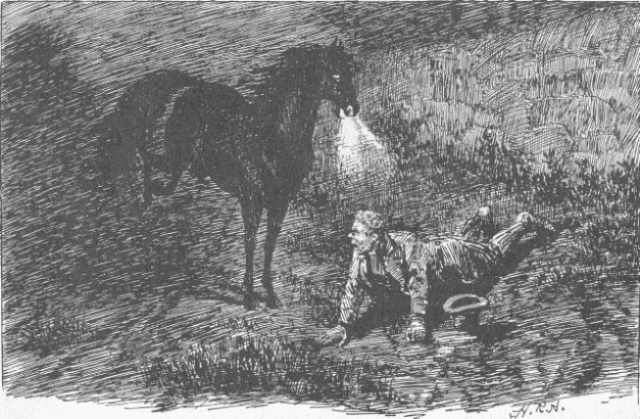 He achieved this by using a special bridle incorporating three hairs of the Púca’s tail. Brian managed to control the magic horse and stay on its back until, exhausted, it surrendered to his will. The king extracted two promises from it; firstly, that it would no longer torment Christian people and ruin their property and secondly, that it would never again attack an Irishman (all other nationalities would seem to be exempt) except those who are drunk or abroad with an evil intent. The latter it could attack with greater ferocity than before. The Púca agreed to these conditions. However, over the intervening years, it would seem to have forgotten its bargain and attacks on property and sober travellers on their way home continue to this day. The Púca is said to have the ability to speak like a human and has been known to give people good advice and lead them away from harm on occasion. A certain Lady Wilde recounts a tale of a one farmer’s son and his most fortunate encounter with the Púca. A farmer’s son named Padraig one day noticed the invisible presence of the Púca brushing by, and called out to him, offering a coat. The Púca appeared in the guise of a young bull, and told him to come to the old mill at night. From that time onward, the Púca came secretly at night and performed all the work of milling the sacks of corn into flour. Padraig fell asleep the first time, but later concealed himself in a chest to catch sight of them, and later made a present of a fine silk suit. This unexpectedly caused the Púca to cease their work and disappear. But by then the farmer’s wealth allowed him to retire and give his son an education. Sometime later, at Padraig’s wedding, the Púca left a gift of a golden cup filled with a magical potion said to ensure a long and happy marriage. The Púca are mainly associated with Samhain (31st Oct) and November 1st is considered Púca‘s Day. This coincides with the harvest and the traditional customs that when the harvest is collected the farmer must leave a few stalks behind, this is called the Púca‘s share and it is left behind to appease the Púca so as not like to incur it’s wrath. It is said that when we see the rain falling on a sunny day, which it does a lot in Ireland, the Púca is guaranteed to be out and about that night. Another belief is that berries that have been killed by the frost overnight should never be eaten as it is the Púca‘s spit that is on them which is poisonous. There is the infamous scene in the 1959 movie Darby O’Gill and the Little People when the Pooka scares Darby into falling down the well , where he first meets King Brian of the Faerie. For every positive tale of an encounter there are several that tell of its mischievous nature where it roams large areas of countryside at night, tearing down fences and gates, scattering livestock in terror, trampling crops and making mayhem. To end I would suggest a word of warning, be prepared and like meeting any stranger for the first time, show a little respect, it might just save you from falling foul of them. 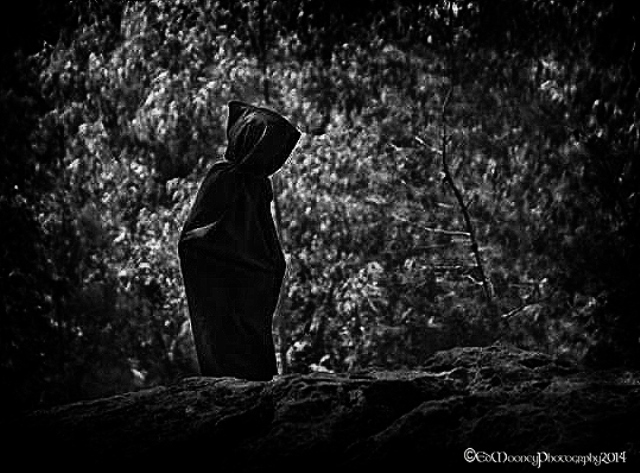 This entry was posted in Samhain and tagged Ed Mooney Photography, Faerie Folk, Halloween, Haunting, historical, Ireland, Legend, Legends, Mythology, Samhain, Shapeshifter, Spirit Ghost, The Púca, The Pooka, Tuatha Dé Danann. Bookmark the permalink. 17 Responses to An Púca, A faerie Ghost. Reblogged this on Faith Cloud. Happy Halloween Ed! Have fun. Thank you Robert, you too, have you any mischief planned? Excellent Ed. Even in modern Ireland there is still a healthy respect for the ‘good people’. A nice exposition of the Puca which is much scarier than old ladies in pointy hats. Among all the Hallowe’en trivia here is an excellent post on a deeply-embedded Irish myth – or is it? Hi Ed, just wanted to say how much I enjoyed this story! It’s great… although I think the truth has been heavily doctored by you-know-who! Loving the spooky images, too! great stories as always Ed! !